This is my reason. What's yours? Tell me why you deserve free chocolate and I'll give you some! I'm very excited to tell you that Married to Chocolate turns one this month and as a thank you, this chocolate chick is giving away big fat baskets of Ghirardelli chocolate. "I deserve free Ghirardelli chocolate because ____________________." The most creative answer wins a basket of Ghirardelli chocolates-a $60 value, mind you. Contest starts May 1 and ends May 28 at 12NN. One winner will be chosen every week. 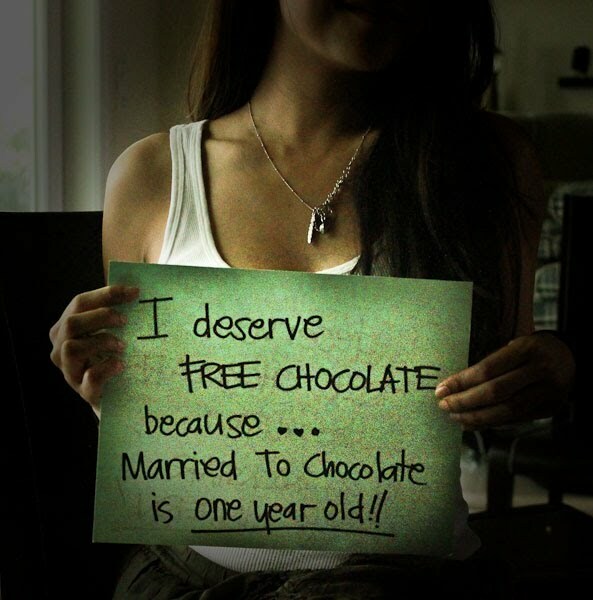 ** Winning entries will be posted on the Married To Chocolate Facebook page so make sure you're a fan! The good folks at Ghirardelli reached out to me to help them promote their Ghirardelli Moments campaign so if you have a second today, visit their website and share yours. You get to win tons of cool prizes, including a trip for two to famous Ghirardelli Squares around the world (San Francisco, New York, London, and Venice). They have a photo contest going on too. 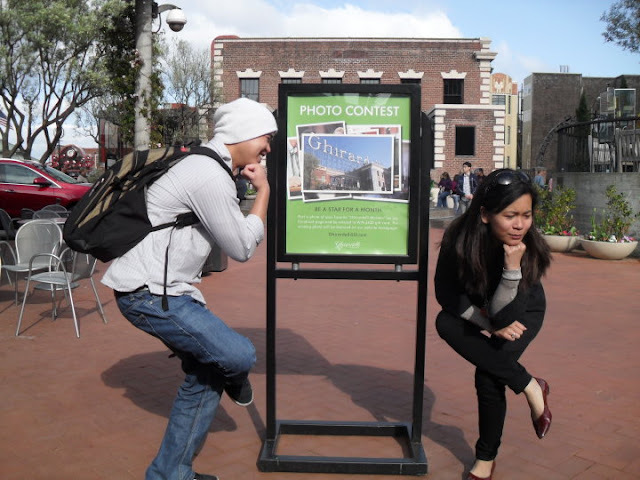 Look at what my friends Suzy and Mino did at the Ghirardelli Square in San Francisco last March. The challenge was to take a photo of a Ghirardelli moment. This is Suzy and Mino.. "thinking." ** Pssst, US Only! We need a US address to ship the chocolates to! I deserve free chocolate because I'm the first one to comment! Dibs! :) Happy weekend! Ay! Haha. Maybe not :) Then, my backup reason is because May is the start of the month when EVERYTHING in my life will be changing. Scary-exciting! i deserve free Ghiradelli chocolate because i need to constantly be on a sugar high to keep up with the kids! Because I've been really sweet recently. Almost as sweet as marriage and chocolate! I deserve free Ghirardelli chocolate because I am a chocolate hoarder and can't get enough of it EVER. I deserve free Ghirardelli because my husband has been working out of state for 8 months now and the only way I can even begin to feel euphoric without him, is to have a wonderful piece of chocolate lay on my tongue melting down my throat enjoying the sense of smooth, rich goodness that only chocolate can provide. Not quite like having hubby home--but it might be a close second! I deserve free Ghirardelli chocolate because I always try the stuff you make and post the links on my facebook page. I also deserve it because I love chocolates! I eat them for breakfast! I eat them all day! Chocolate is just not for dessert...it is for breakfast, lunch & dinner! Ask Craig he will tell you when in Hawaii we went to a 4 star restaurant and it was I who ordered chocolate dessert for dinner! It is the only way to dine!Oh and drink too..chocolate liqueur,chocolate amerreta liqueur, chocolate raspberry liqueur is what I brought back from St. Thomas...so I can drink as well as eat to get my chocolate high! 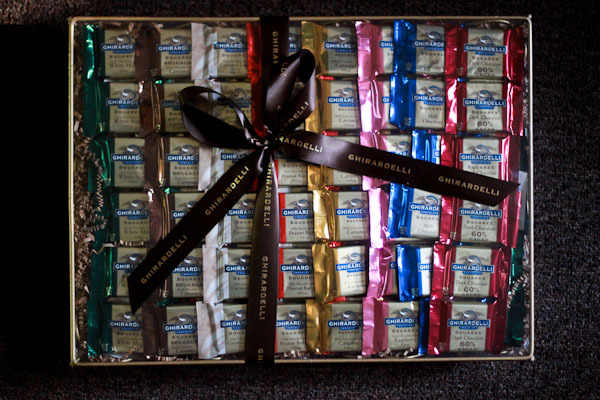 Congratulations and enjoy your big fat basket of Ghirardelli chocolate! Try not to eat them all in one sitting.